iGEM is an annual world-wide synthetic biology competition. Teams of students use standardized genetic parts to address real-world problems in fields including health and medicine, manufacturing, bioenergy, even art and architecture. Students also take their work beyond the lab, engaging with clinicians, regulators, policy experts and the general public to maximize their project’s potential real-world impact. 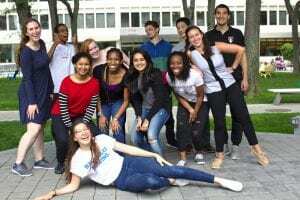 This year’s MIT iGEM team is composed of eight MIT undergraduate, two Wellesley undergraduate, and two high school students. The team draws students from a wide range of departments, including biology, bioengineering, electrical engineering and computer science, math, chemistry, and mechanical engineering. The iGEM team begins meeting in January. With the help of the team’s advisors, students choose a project that matches their interests and takes advantage of the resources and expertise of the hosting laboratory. Over the course of the spring semester, the team refines their project idea, designs new genetic parts, and begins to learn the lab skills they’ll need to accomplish their project. The centerpiece of iGEM at MIT is the 10-week summer semester. The students work at the MIT Synthetic Biology Center full-time. In addition to their research, they practice communication skills with the BE Communication Lab, engage in outreach with the Boston Museum of Science, and work closely with experts in their chosen problem. iGEM culminates at the International iGEM Jamboree, a synthetic biology competition held each fall here in Boston. Each team presents a 20-minute talk and a poster. Teams are judged on the quality of their science as well as factors such as communication, outreach, collaboration with other teams, and the quality of genetic parts they submit back to the Registry of Parts for teams to use in future years. Teams can bring home awards for the best project in their subject area, as well as special awards for human practices and outreach, innovations in measurement, new biological parts and part collections, and new software tools, among others. iGEM is a unique undergraduate research experience. Participation in iGEM is different from a traditional undergraduate research experience (UROP) in several important ways. Perhaps the biggest is that students on the team participate in the entire research lifecycle: from project conception, to choosing their approach, planning and executing experiments, analyzing data, and finally communicating their results to a broader audience. This contrasts with a traditional UROP, where a student is paired with a graduate student or postdoc mentor to collaborate on their mentor’s ongoing research. Second, working on a team is central to the iGEM experience. Teamwork helps the students develop their communication and coordination skills in an authentic collaborative environment, skills that are essential for professional scientists and engineers. As the summer progresses, students frequently begin to specialize, becoming experts in aspects of the project that they find interesting and rewarding, which gives them a greater sense of ownership over their work. Working on a team also improves student learning, both of broader skills for experimental design and analysis as well as the fine-grained operational knowledge required to execute them. 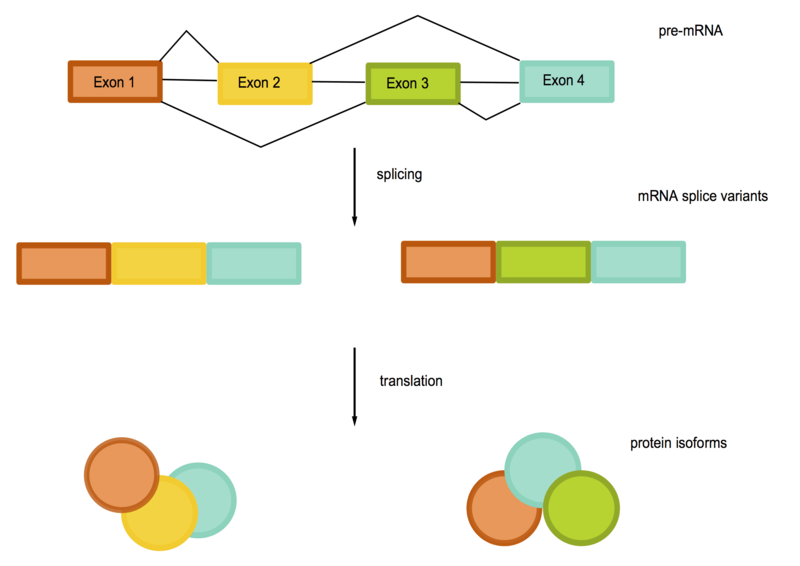 Alternative splicing is a process that takes pre-mRNA transcripts and modifies them in various ways to create a final mature mRNA molecule for translation. Portions of the mRNA known as introns are removed; other sequences known as exons remain to be translated. By altering which exons are included in the final mRNA, functionality of the final protein can be altered as well. Our iGEM project seeks to control alternative splicing of RNA, specifically exon skipping and inclusion, using a protein called Cas13a. This is a protein that attaches to RNA via a complementary guide RNA, then cuts the RNA strand. For our purposes, we are using a modified version of this protein, known as dCas13a, that can attach, but doesn’t cut. By targeting certain portions of a fluorescent protein construct, we can determine whether or not we achieved the intended isoforms based on the presence or absence of the fluorescent protein in addition to sequencing. 2015: Turning agricultural waste into biofuels. 2014: Working to cure Alzheimers disease. 2013: Synthetic cell-to-cell communication for synthetic tissues. 2012: Encoding genetic logic in small RNA-based logical gates. 2011: Mammalian cell patterning and tssues by design. Follow the links to visit each team’s project website. We welcome the support of businesses, foundations and individuals as we work to provide authentic research experiences for undergraduates here at MIT. For more information, email Professor Weiss at rweiss AT mit DOT edu or Brian Teague at teague AT mit DOT edu.